We had a need recently for two plastic pallets, so we ordered them. And here they are, just off the truck, sitting on our dock. How do you ship pallets? Sure, you just stick ‘em on a pallet, slap on some shrink wrap and off they go!! Is this nuts or what? Why pay for the wood pallet? Why not just secure the two plastic pallets together and ship them, with the label on top, which obviously works just fine? Now we have to dispose of the wood pallet. It fills up a landfill unnecessarily, is a hassle, is a home for rodents while it sits outside waiting for a disposal truck. And who pays for the wasted pallet?? Yep, we do. We pay for the waste of our suppliers. We pay for this waste of overprocessing. And I really wonder if this isn’t the case for our palletizing supplier. They put all their outbound stuff on pallets, so shipping pallets is simply no different. They just don’t see it. That’s a management problem. That’s a leadership problem. And all of this makes me wonder where I’m palletizing pallets and just don't see it. Just won't see it. So I went to the Pepsi machine, content to have a Diet Pepsi if I could find it. Again, many offerings but only after scanning the entire machine did I see three Diet Pepsis remaining. I bought one and sat down nearby to continue a conversation with a friend. A few minutes later, a trim, fashionably-dressed lady walked to the Coke machine and I noted that she was doing the same search I had just done. Hands on hips, she walked away from the Coke machine to the Pepsi machine. Scan, look, finally find the Diet Pepsi, which she bought. Both machines were chocked full of various drinks; but not the one we wanted. I then wondered how much money the vending machine company was losing and how it could improve their offerings at this vending site. If the machine is sold out of Diet Coke, fill one additional runway with Diet Coke. Take the lane from Coke. If a drink is down to a single runway, leave it. If a drink on a single runway has sold zero items since the last refilling, put a small tag on the front. If a drink on a single runway has sold zero items and already has a small tag on the front of it, remove that drink from the machine and report it to HQ. If a drink on a single runway has sold some items and has a small tag on the front of it, remove the tag and refill. In this way, the vending machine company would allow the customer to tell them exactly what they want to buy in this setting. The company could then supply the most inventory of the most popular items and stop using valuable cooler space for items that don’t sell. This is pull vs. push. If the vending machine company presumes to “know” what the customer wants and fills its vending machines accordingly, they are pushing this on the public. If, on the other hand, they make an educated guess about what to put in the machine at its initial installation, then rapidly change the offering according to standard work as I proposed above, it is allowing the customer to pull what they want. This is nothing more than a series of rapid PDCA cycles that will, in short order, get to a place of maximizing cash flow through a fixed asset. Put another way, it is silly to predict what the customer wants. Push is all about prediction. Far better to have a system which makes no attempt to predict but makes every effort possible to respond. I was standing in the security check line at the Portland Airport on my way home from a Christmas visit to my son Nathan in Oregon when I got to be a living, breathing part of a classic process check. Stay with me here. All six security lines stopped; a junior TSA official physically blocked each line. Five senior TSA people RAN to the exit point of the security area, where there seemed to be some activity that took their attention. And I stood there thinking “Cool!!! This will be really neat!! What can I observe?” I suspect I was alone in that perspective amongst my fellow travelers. And I witnessed TSA do three of these four steps. They had clearly rehearsed it and did it very efficiently and professionally. First, the TSA team detected the error. I don’t know what “Code Blue” is and I couldn’t find a reference on the web to TSA’s use of it. That’s probably their intent. From the commotion I observed, it could have been a person leaving the search area without being released. I don’t know. But, it was clearly a problem TSA considered serious. Immediately, things stopped. There was NO movement and I mean none. The entire set of six security lines shut down immediately. No bags moved. No people moved. It got really quiet. The ONLY motion was designated TSA people running to the exit area. It felt almost like a cartoon sequence, in which a bustling, busy process stops. Instantly. In about 60 seconds, TSA fixed whatever the problem was. An official standing near the exit area stated, authoritatively, “All Clear.” Other officials repeated “All Clear,” and, as quickly as we had stopped, the process came back to life. We moved through security as if nothing had happened. I have no idea if TSA pursued a countermeasure, if they did a “post mortem” to see how they could have prevented whatever triggered this Code Blue. Line stops work. In this critical security issue, the basics made it go. Rehearsal is vital. I was impressed with the combination of speed, urgency and calm by the TSA folks. This only happens with practice. This is how effective teams work. Minimize WIP. Only a relative handful of us were WIP…most of the people in queue were still fully dressed. When we minimize WIP, we can do line stops, repeatedly, to drive quality while not hammering throughput. Think through where your “Code Blues” show up. And smile and thank a TSA agent next time you travel. We had our monthly meeting of the Wabash Valley Lean Network last week. On top of an excellent regular program, I also saw a marvelous demonstration of how to learn something new. During the closing portion of the meeting, we usually ask if people have “hot issues.” An engineer from one company asked if anyone in the group had experience eliminating waste in utility bills. Several volunteered and continued the conversation after the close of the meeting. Watching the interaction was fascinating. The engineer asked questions, listened carefully, asked follow up questions. And she got a lot of very practical information. Which showed several principles of learning. She sought a context to find experience. She didn’t ask the question at a local restaurant. She asked at a gathering of process improvement geeks. She asked specific questions. Thus, she closed the scope to something people could respond. She was genuinely interested. Her eye contact, tone of voice and follow up questions all reinforced the perception she was interested in what others had to say. She was not defensive. When someone made an odd comment, she still accepted it. She did not reject any idea, though several may not have been applicable. She said “thank you” to all contributors. She knew no one “owed” her a response. Thus, she showed appreciation for the knowledge each shared. Watching this from a slight distance was fascinating. In a matter of 5-8 minutes, she had a tutorial in cutting energy usage in her complex industrial setting. Central was her specificity of question and her openness to whatever information came her way. In my opinion, it is this lack of defensiveness that is central to learning. Any kind of learning. Try asking a specific question about something new today, be nondefensive in response and body language and say “thank you.” What you learn might surprise you. Influential writer Seth Godin posted How many bloggers does it take to screw in a lightbulb? and invited other bloggers to describe their view of compact fluorescent energy-saving bulbs. Why have these bulbs not caught on, Seth wondered aloud? Good question…I offer my thoughts and, not surprisingly, I decided to do it from a Lean perspective. First, I went to gemba, the actual place where the action happens. On my way home from work, I bought a CF bulb, to experience it for myself. Then, knowing we had extended family coming over for supper, I emailed my wife that we’d have a discussion over dinner about CF bulbs. She was thrilled. When I got home, I then installed the bulb in a lamp on my bedroom dresser, where a conventional incandescent bulb had just burnt out. First, the bulb is expensive. I paid $4.82 for a single 60W-equivilent bulb. The purchase broke a $10 bill. I probably could have had 8 regular bulbs for the same price at the same store. Second, the package labeling was intimidating. There was much fine print on the back, with dire warnings about mercury contamination. It made the bulb seem complicated. Mercifully, the conversation then shifted to the grandchildren and whether any more are on the way. Though others grew tired of talking about CF bulbs, I further examined this myself. I installed the bulb in our bedroom and stood back to look at it. Not as bad a hue as I had feared. In a small light fixture, under a lampshade, it really looked OK. So why haven’t CF bulbs caught on? My thoughts from my observations today. The energy savings of CF bulbs are clear. The cost is intimidating. Isn’t this a business opportunity for someone with a Lean design perspective? To set a retail price target of, say, $1.00 for a bulb and then set out to wring waste out of the process to meet that aggressive target? And what about the consumer? Many enthusiasts feel that we should buy CF bulbs because of the “cause” of energy savings. That won’t carry the day for widespread acceptance. The bulb has to be cheaper. A strong customer focus could help this…probably better design wouldn’t hurt either…the bulb doesn’t look like what we think of when we say “bulb”. It is a tough sell to take hard cash out of my wallet to buy the bulb and then hope that small decreases in electric bills that don’t go back into my wallet will come, distantly, on some future day. When we think about mistake proofing, we most often think mechanically. The best example is the humble electrical plug. 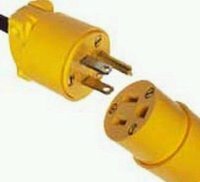 It takes no instructions, can only go in one way, won’t connect to a telephone plug, is safe…in short, truly mistake proofed. But many processes involve instructions. The (usually) unstated expectation is that the person doing the process can and will read the instruction and follow it. Which often does not happen. 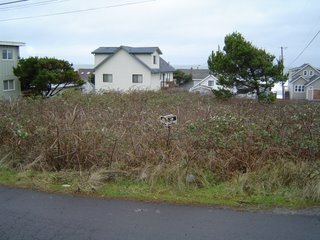 Since I think about such things even while on vacation, I stopped and pondered this sign I saw on a vacant lot while visiting my son in Oregon over Christmas. 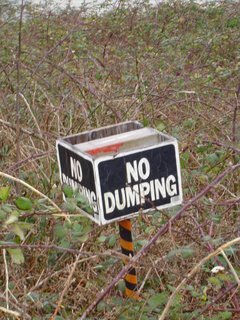 “No Dumping” seems simple enough. A written instruction which should be followed. And, as my Dad used to say cynically, when seeing such a notice, “Yeah, all the honest people will follow that sign.” I suspect the owner was not really worried about the "honest people." Stepping back a bit, you can see the owner of this property mistake-proofed her written instruction. This entire vacant lot was completely overgrown with a thorny, gnarly, entangled mess of mutliflora rose vines. Forget the written instruction; this lot screamed silently. 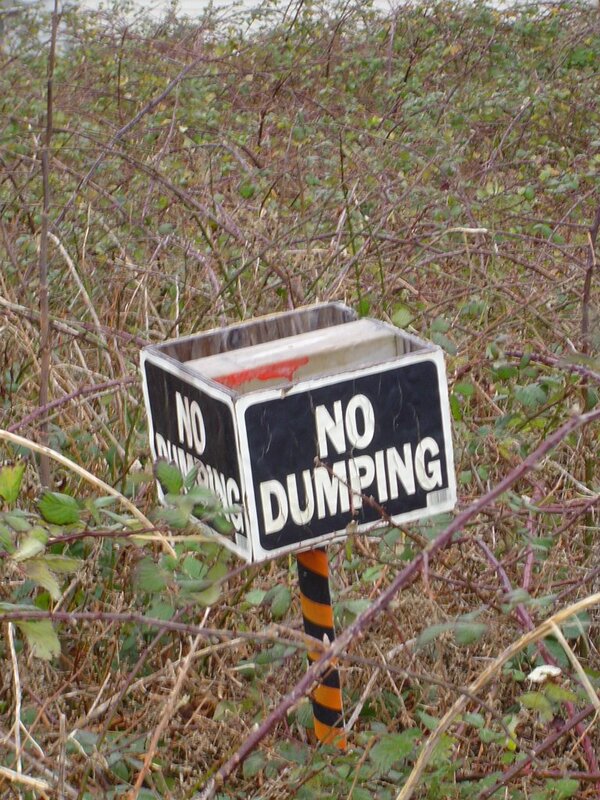 "Dumping?? Here?? No way. Go dump your junk elsewhere. " Why did this intrigue me?? Because it challenged my thinking so substantively. I’m now asking myself how I can “put in some thorns” to assure a written instruction gets followed. I think of my friend Al, a structural engineer, who has to make sure construction crews follow his drawings, to ensure structural integrity. How does he put in some "thorns"? This is not an unusal problem. What are examples of “thorns” ? There are many more...I'm just brainstorming. Perhaps this will trigger some creative thinking for you as well. Whatever you do, though, throw your trash somewhere else!! And, if you need to find a cool place to stay along the Oregon coast, I'll put you in touch with my son...thanks, Nathan!